For some unknown reason, my Facebook Page has no Admin. I created the Page myself and have even assigned 2 Editors, but when I checked the page roles last month, I noticed that my status has changed from Admin to Editor. Now we are 3 Editors and no Admin. Please do note that I did not accidently demote myself as Facebook does not permit that when you are the sole admin. I also did not promote someone else to Admin and got myself demoted that way, because even if that did happen there would still be at least 1 Admin left. If you check the attached image below you'll see that there are in fact no Admin on my Page, which means this has to be a bug? Follow this path. Options > Report a Problem. Use as many details as you need. 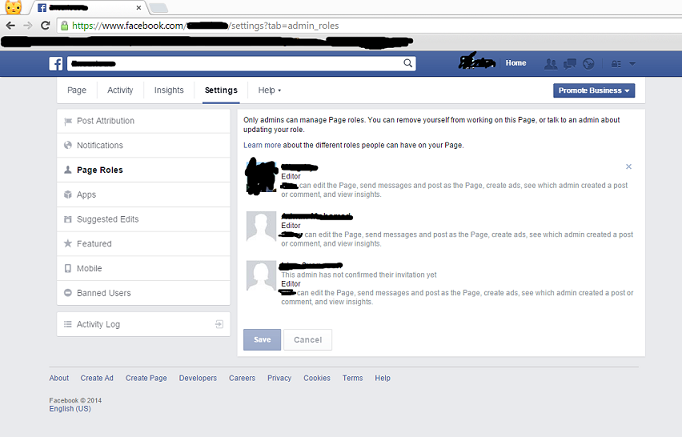 From my experience running a page, if you have more than one page admin, you the page creator can be removed by the new admin, vice versa. This was some time ago and things may be different. But their help page gives the impression it's still the same. It is highly recommended to ask Facebook support (https://www.facebook.com/help). If it is a real issue by Facebook they will investigate and solve. Facebook like box for page (social plugin) blank when logged in as page - real Facebook bug or not? And remedy? How to manage a facebook page with multiple content creators and one editor that approves posts?